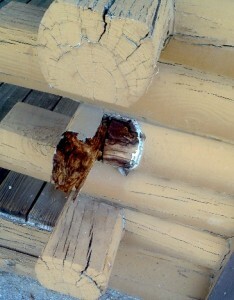 Jun 1, 2012 // by admin // Log Repair and Replacement, Restoration // Comments Off on TIME TO CONSIDER LOG HOME MAINTENANCE…? Before you run to the nearest hardware store and start trying to fix everything yourself, here are a few tips that may save you a lot of time and money in the long run. Beware of the “know-it-all” handyman or painter who may give you poor advice. Many of the products that you might use on a conventional house can cause a lot of damage when used on a log home. Logs need to breathe…what moisture gets in, must get out! • If it is not made by a company that only makes log home products, don’t buy it! 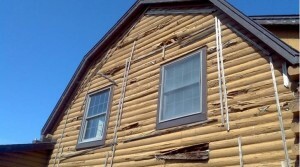 • Never use deck/siding stain on your log home. These products trap water and moisture in the log, eventually causing it to rot. • NEVER paint your logs! Nothing makes a log rot faster (see inset pictures). • Never use expanding foam. It acts like a sponge, drawing in water and holding it in the logs. • Never use silicone caulking on the logs. It isn’t designed to stick to the logs and thus allows moisture to be trapped once it gets in. • There are better ways to clean logs other than sanding. Sanding should be a last resort, as it causes major color variations, among other issues. The easiest way to get the right information is to call a log home maintenance contractor, like Alpine Blue Log Homes, Inc., to come out and assess your home’s needs. Our log home specialists are certified in determining the correct products and application methods for your log home. We use only log home products made by reputable log home product companies, such as Perma-Chink, Sascho and Weatherall. While other products may be cheaper or more readily available, log home stains and caulking are specifically designed to adhere to logs and stretch to maintain a tight seal by following log movement. Do it right, do it once…call us first!